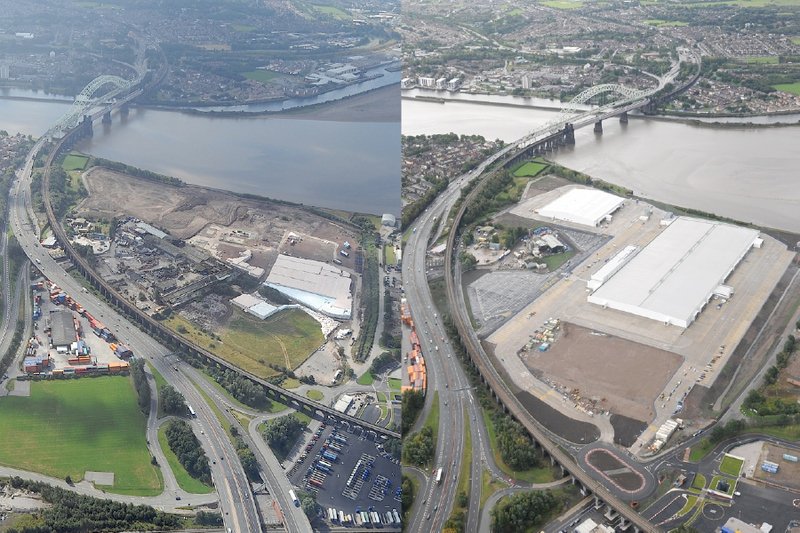 This project, for Stobart Developments, involved the regeneration of a heavily contaminated area of land fronting the River Mersey. Historically the site had been used as a chemical works and dock, which presented a number of significant environmental and geotechnical challenges. Extensive underground relic foundations and other structures remained on the site, which required detailed consideration in the design and construction of all ground-works and led to the decision to pre-bore all pile locations. Fairhurst were appointed to provide all civil and structural design services on the project as well as provision of specialist geo-environmental services and the design of all below ground foul and surface water drainage. Phase 1 comprised a 420,000 sq ft Insulated Envelope Refrigerated Distribution Centre, a 100,000 sq ft Recycled Services Unit and associated external yards and car parking. The site is accessed by a new roundabout and almost 1km of new and upgraded highway, all of which were designed by Fairhurst. As a condition of gaining planning consent for the development, an adjacent redundant water course was decontaminated and brought back into use. This included the construction of a new tidal discharge to the Mersey which required the design and construction of a new reinforced concrete box culvert.